Occasionally I come across a picture of some poor little “parent” bird feeding a huge brown-headed cowbird (Molothrus ater) nestling. One wonders how the small adoptive parent manages to keep the nest intruder nourished until it fledges. In reality about 97% of cowbird eggs laid in host nests never result in mature birds. Yet this seemingly small survival rate is sufficient to maintain the species and also allow for its range to spread. As I mentioned in my previous post, “Brown-headed Cowbird“, many birds recognize alien brown-headed cowbird eggs in their nest and have various strategies to dispose of the unwanted eggs. However, most hosts accept the cowbird eggs. With a 10 to 12 day incubation period, which is shorter than the incubation length of most host birds’ eggs, the cowbirds hatch faster and get an advantage over the other hatchlings. The cowbirds are more developed by the time the other chicks hatch and can out compete their nest mates for food and attention. Additionally cowbird nestlings toss other eggs out of the nest, throw the hosts’ offspring out of the nest or smother non-cowbird chicks in the bottom of the nest. The cowbird chicks also develop faster than the other nestlings, 8 to 13 days to fledging. I always think of brown-headed cowbird babies as bullies. Brown-headed cowbird nestlings need animal or insect protein to develop and survive. Often the cowbird female lays her eggs in the nest of a bird, such as a finch, that has a completely vegetarian diet and raises its young on regurgitated “milk” composed of seeds and other vegetable material – no animal protein. The cowbird young in these “vegan” nests usually do not survive to fledge. Those cowbirds that do fledge are almost always weak, underdeveloped and die within a short time. This cowbird was photographed next to our house in Modoc County CA. 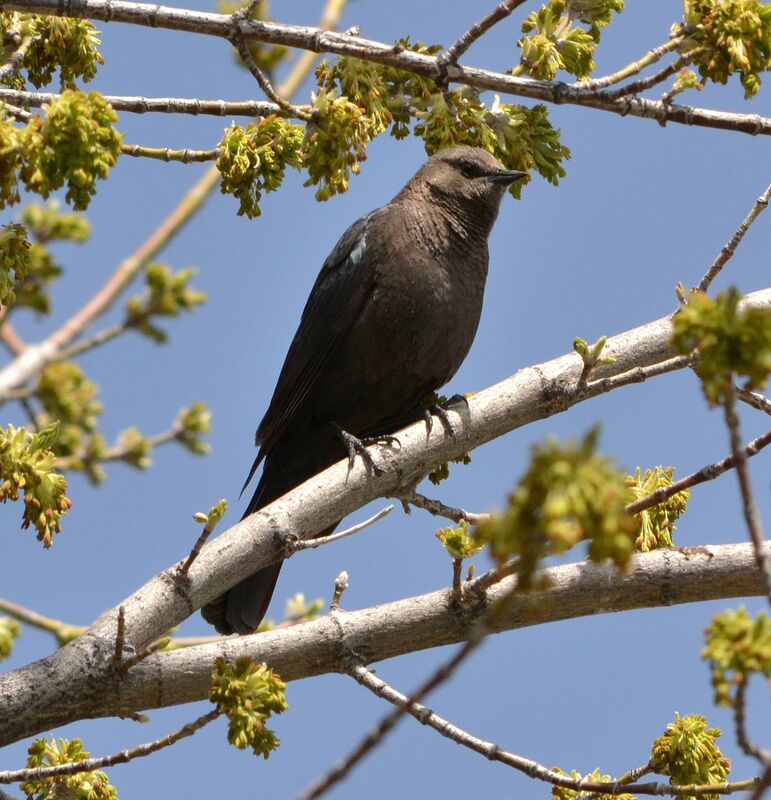 This entry was posted in Birds and tagged brown-headed cowbird, common cowbird, Molothrus ater, nature photography. Bookmark the permalink.